I’ve started a new reoccurring series on my blog focusing on healthy lifestyle tips. Check back for alternative ways to eat healthier, stay fit and live a good, full life. First up- coconut oil. My eating has become healthier in the second half of my life as more is learned about what makes our bodies work. Some of these foods were considered bad for us or fattening in the past. For instance, many people used to avoid eggs, but free range local eggs are about the healthiest thing you can eat. Once, a nutritionist told me to only eat a quarter of an avocado in my salad. Now I often eat a whole one in one day. An onion a day is great for you, too. Raw nuts, especially if you can find some that are not pasteurized. They are not only healthy, but they taste great, too. These foods must move over. Coconut oil is my new staple and it should be one of yours. It is one of the suggested preventions for several diseases that you do NOT want to have. 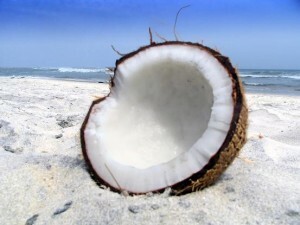 “The health benefits of coconut oil include hair care, skin care, stress relief, maintaining cholesterol levels, weight loss, increased immunity, proper digestion and metabolism, relief from kidney problems, heart diseases, high blood pressure, diabetes, HIV and cancer, dental care, and bone strength.” – OrganicFacts.net. Many people are taking another look at coconut oil. You may wonder when to use such a strange product. Buy organic brands. Read all you can about it. You will discover that it is not only tasty, but healthy. You may also find that it helps shed pounds. It has been working well for me and that makes me find even more creative uses. 7. Instead of olive oil, put a dollop in boiling water to help separate pasta. 8. Put it in anything that will heat up, and you will sense rather than actually taste the fresh cleanness of it. You may add as much of it as you can to your daily food. Stir fry with it, add some to soups or stews or almost anything you cook, even salad dressing. Though that can be tricky because it is generally a solid oil which you may take out of the jar in spoonfuls. In summer it may stay liquid if you keep it away from the coolness of a refrigerator. You can cook everything with coconut oil. It is such a clean tasting oil. And it heats up well. The best part is that it has all sorts of health benefits. For more information click here read the whole article. Do you have a favorite food in the healthy category? Please leave a comment and tell us about it.